They come from different countries in the world, staying back in Vietnam due to different reasons, but all come to Vietnam for the same reason: bring a better life to needy people. Dr. Bob Roberts Jr. is the founder of Glocal Ventures and is the founding pastor of the 2500+ NorthWood Church near Dallas/Fort Worth, Texas, US. 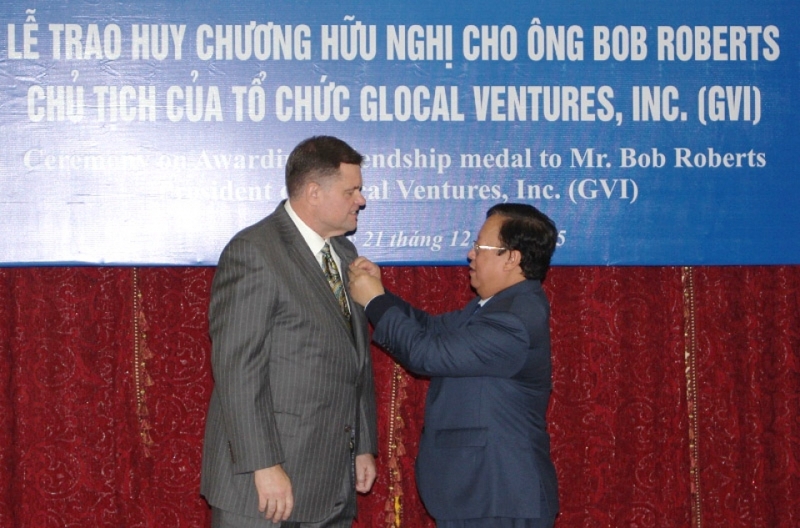 Since the first day he arrived in Vietnam in 1995, Bob has successfully raised USD 3.5 million to assist disadvantaged communities in Vietnam via numerous projects conducted by GV in various fields, including micro-credit, orphans care, construction of medical center, schools, medical equipments supply, healthcare service, education exchange, English language teaching, etc. As a high-level pastor of the Northwood Church which is in charge of 130 churches across America, he has mobilized the sponsorship from people in and out of the organization. In addition to financial support, GVI also lends Vietnam supports in terms of expertise, technology transfer. Especially, together with GVI, the pastor has brought over 2,000 volunteers to Vietnam to take part in community supports activities. In order to reinforce mutual understanding, when Bob Roberts came back to US, he often brought along many Vietnamese handicraft souvenirs to display inside the church, as a way to introduce Vietnamese culture to the people in US. With all of his dedication, Bob Roberts plays an essential role in fostering the Vietnam – US ties. In his heart, Vietnam and its people always occupy a distinguished place. He also infuses the love for Vietnam in his family. Nowadays, Bob’s organization is still working on mobilizing resources from overseas to help Vietnamese people. GVI’s strategy is to recruit volunteers in Vietnam, who are eligible to conduct development projects in the country in areas such as: orphans care, special education, etc. In over the last 20 years, Ino Mayu, a 41-year-old Japanese woman has been most of her time living in the countryside of Vietnam. She has become so close to the locals that they have given her a Vietnamese name “Chi May” (sister May). Ino Mayu came to Vietnam in 1997 to pursue a course at the Center of Vietnamese study and Cultural exchange, under the Faculty of History in Hanoi National University. From 2003 to 2009, she worked for Japanese non governmental organizations in Vietnam, focusing on community-based projects to help needy localities. In 2009, the organization May worked for ended their work in Vietnam, which saddened May a lot. In order to continue helping Vietnamese farmers, she decided to stay back and establish an NGO named “Seed to Table." Seed to Table works in the area of comprehensive rural development, particularly in organic farming in Hoa Binh and Ben Tre, two provinces in the Northern mountainous region and the Mekong Delta, respectively. These projects aim to help the people adopt sustainable farming methods, reduce production costs, increase profits and protect the environment. Seed to Table's approach has received positive feedback from local relevant authorities as an effective model, and has been replicated widely. 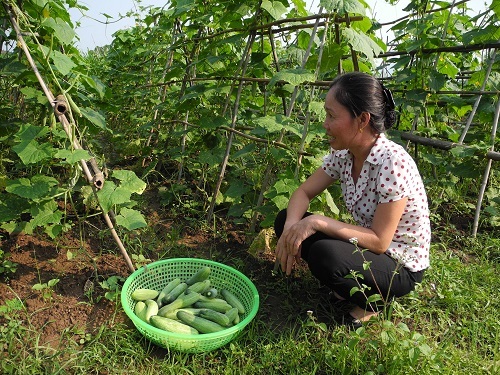 In Hoa Binh province, May instructs people to grow organic vegetables, and find market for their “clean” projects via organizing conference connecting suppliers with restaurants. In 2012, Seed to Table was brought to the South (Binh Dai district, Ben Tre province), with the initiative of "cattle bank" to help farmers leverage their livelihood through husbandry together with organic agriculture. Hundreds of farmers have got rid of poverty, thanks to Mayu's assistance. Nowadays, she has become a close friends of them, the one whom they can consult on any problem in life, not only agriculture. Children Action, a Swiss-based NGO started its first project in Vietnam over 20 years ago. Since the year 2000, in addition to building schools for poorest localities, Children Action has been subsidizing money to improve the meals for 815 poor students. Every year, when the new school year is about to start, laptops are the gifts Children Action has for needy schools. Earlier, in 1994, Children Action has founded an orphanage center in HCMC where 527 blind children are taken care. In 1996, the organization actively lended support to heart surgeries, cleft palate and lips surgeries, victims of burn injury and other diseases for hundred of poor children. Another great friend of Vietnam is ActionAid International (AAI). The organization has been standing by Vietnam in rural development, poverty eradication, civil’s capacity building for nearly 30 years. Remarkable projects conducted by AAI are in the various areas,including empowering women, establishing anti-domestic violence center. These activities not only better the living condition of the victims, but also help improve people’s awareness of women’s rights. Another great friends of Vietnam is Agricultural Development Denmark Asia (ADDA) of Denmark. ADDA’s projects mostly focuses on promoting sustainable and effective farming measures such as comprehensive diseases and pests managements, organic products production and marketing, legal consultation for rural communities. Via ADDA’s help, people, especially the poorest community in Northern mountainous area have been step by step improving their production capacity./.